With this kit you can have vertical doors on your ride! Protocol's advanced Lambo door kit uses the latest technology to ensure you a long life of smooth operation. Each kit is brand NEW in the box and comes with the factories full warranty and detailed instructions to make installation a snap! Each heavy duty arm is plated with anti rust zinc plating resulting in a nice finish and years of trouble free operation. Be aware of lower end kits that use cheap powder coating to hide metal imperfections that can result in the unit failing after a couple of months of operation. 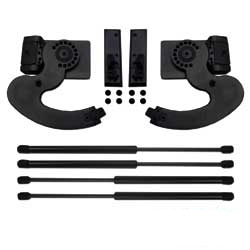 Protocols unique universal design will make this system easy to install on all vehicles on the market. Protocol’s kits include all the parts you need for installation including 4 heavy duty 200+ lbs gas struts to ensure door operation. In addition Protocol's advance adjustment points allow you to fine tune your installation resulting in a perfect factory fit. Unlike Other Kits Protocol's Vertical Door Kit Offers! lower quality vertical door kits!